No, you did read that title correctly. I am writing on a Stationery website about a brand new computer game I just purchased. It’s not very often that these two pleasures of mine align in such a way which would give me an excuse to talk about them both, but that’s exactly how it has gone down. 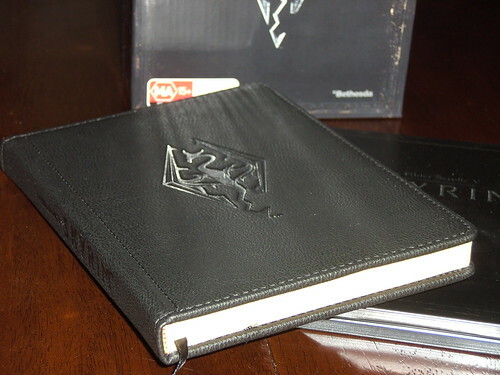 I walked into my local EB Games and went to pre-order this new game which I was quite excited about in the first place, and upon placing my order, was informed the Limited Edition included a notebook. A real, blank notebook. Perfect! I put down my money, and awaited the day of release (tomorrow, 11/11/11). So today at work I find out that the street date for the game has been broken, which means I could pick it up that night when I got home. The only problem was that due to it being locked online, I wasn’t able to play it until midnight. So here I am at 10:30pm writing a quick post about the notebook which came with it! The pack itself came with a few neat things. 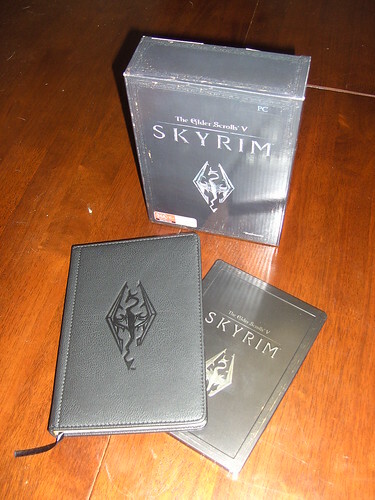 The game, a “Steelbook” game case, a cloth map of the game world, some art cards and the notebook. Considering I didn’t pay anything extra for it, it was a bargain! The thing that we are interested in is obviously, the notebook! The outside of the notebook is very pleasing. It has a hard cover, which is made from some form of soft material (sort of fake leather) which has been stitched around the edges and the spine. 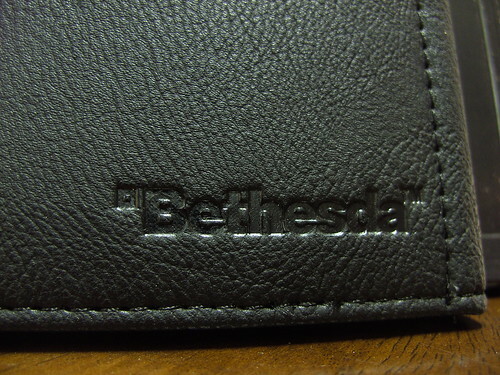 The game logo has been embossed on the front, the name of the game on the spine, and the developer’s logo on the back. The paper inside the notebook is nothing to write home about. It feels quite thin (maybe 60 or 70gsm) and is ruled for most of the page. It has the game logo printed at the top and the game name at the bottom of every single page which I am not too fond of. I think I would have preferred it to have been completely blank, like most old books were. The paper is also an odd yellow colour (which I assume is meant to appear aged) however it just seems kind of… off. At a rough guess I’d say it contained about 200 pages as they are so thin. It’s about the same physical thickness as my Rhodia Webbie. 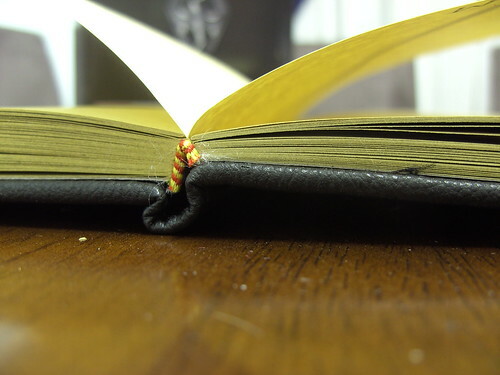 The binding in the notebook is fairly nice, and it can open completely flat. There was some threads which were stuck in the binding, but I pulled them out easily. I’m not sure what the deal is with the yellow and red binding, but it seems pretty firm. Really, I am very happy with this addition to my game. It’s much better than a mouse mat or something else which I would never use. I also like to think that it might help a whole demographic of people who like to play games to appreciating stationery. It looks real nice! I’m the kind of gamers that make a lot of notes while playing. 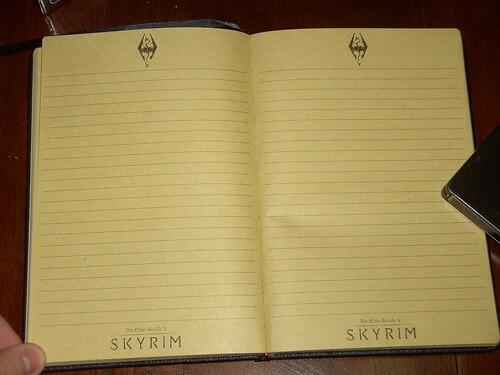 What more suitable notebook one can find than The Skyrim Note? I think you are right! It’d also be amazing to pull it out of a drawer in a few years time and re-play the game, using your own notes as guides of what (or what not) to do! Thanks so much for the aditional information! You seem to know what you are talking about I’m glad you enjoyed the review. I would love to replace the insides of this with something creamy and smooth, possibly a Clairefontaine paper. I don’t think it should be “made” to look old, you should just use it until it looks loved.